Unifor members across Windsor-Essex have rallied in support of General Motors workers in Oshawa. 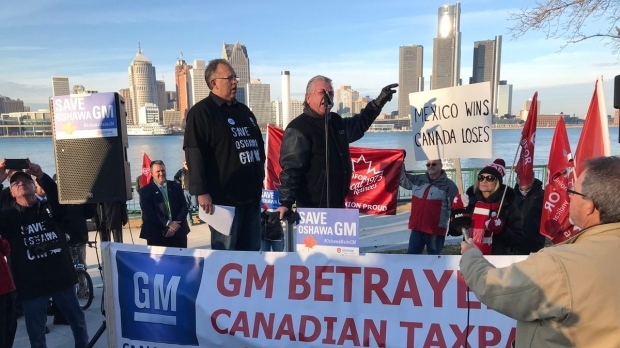 Using the GM Renaissance Center in Detroit as a backdrop, hundreds of people gathered along Windsor's riverfront Wednesday afternoon to show their support for 2500 GM workers in Oshawa. 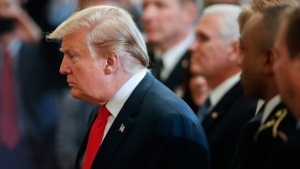 They were told last month that their assembly plant will close in 2019, one of five North American plants that General Motors will close. Former CAW President Ken Lewenza called on the large crowd of union members and GM retirees to pressure GM to stay in Canada. Unifor local 444 President Dave Cassidy tells CTV News Windsor-Essex needs to support their brothers and sisters in Oshawa. “General Motors, you have an obligation, you have a collective agreement to live up to and even passed the collective agreements,” said Cassidy. “You have an obligation to Canadians. We bailed you out, we bailed you out as taxpayers. You have an obligation to taxpayers." Unifor National President Jerry Dias is expected to meet with General Motors management in Detroit on Thursday in an effort to keep the Oshawa plant open.